Many times we, as adults, don’t pay much attention when our children complain that their “joints” hurt. We think they’ve played too hard, want extra attention or possibly just have the flu. There are times, however, when this complaint needs further evaluation by a Health Care Professional as the definitive diagnosis could be none of the above. 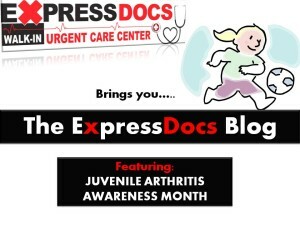 In fact, your child could be one of the many children who have the chronic condition known as Juvenile Arthritis. Juvenile arthritis is considered an autoimmune disorder and scientists have yet to determine the precise cause. One theory is that the “gene” is passed from parent to child whereby this “gene” may lay dormant for years and then awaken from something as simple as a virus. One way to try and determine if your child has Juvenile Arthritis is to document the frequency of their joint pain/rashes/swollen lymph nodes and take this information, along with a family history, to a physician. Your pediatrician may refer you to a pediatric rheumatologist. Blood tests, x-rays and a complete medical history will help the physician to make a diagnosis. Therapy – Exercise is an excellent way to keep the child’s muscle tone in check. It helpS preserve range of motion and functionality. If at any time you have any questions, ask your physician, or walk in to ExpressDocs Urgent Care Center to speak with a qualified physician at your convenience. Visit the Arthritis Foundation and the National Institute of Arthritis and Musculoskeletal and Skin Diseases to read more about Juvenile Arthritis. 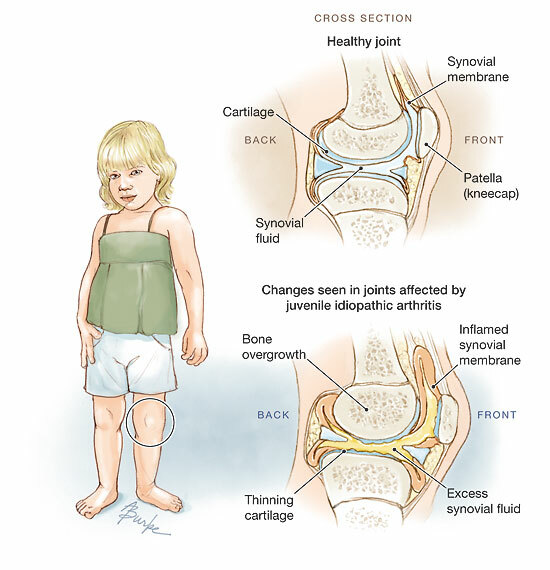 Picture from The Journal of the American Medical Association where you can read more about Juvenile Arthritis.